The difficulty of assessing a film such as Fons Rademakers’ The Rose Garden, is that the boundaries of good and evil are so effortlessly pre-defined that there is little room left for personal opinion and interpretation. Historically, we have been granted such widespread knowledge of the film’s subject matter that its characters, or possible ulterior motives, leave little to the cinematic imagination. Set in a bleak urban landscape near the end of Berlin Wall-era Germany, this staunch, novelistic interpretation of the Paul Hengge novel of the same name recounts yet another series of appalling factual events from World War II, in this case the brutal extermination of 20 Jewish children by way of medical experimentation and subsequent hangings, carried out by Nazi officials. Dutch-born Rademakers confronts the material with a palpable distaste for the Nazi regime while reserving little respect for Germany’s then current judiciary system. His key question seems to be: Has the system improved? What becomes immediately evident is the isolation of Aaron Reichenbach, a survivor of the children’s concentration camp, played charmingly by Maximilian Schell. An ominous opening score and Schell’s perplexed, strained performance work beautifully under the intense scrutiny of Rademakers’ eye. The camera style is “active” – as usual for the director – objects fall in and out of frame as if gliding through an individual consciousness. Relatively static scenes are enlivened by zooms, strange angles and a wide variety of shots, building a hurried structure that nicely complements the nature of the story. Controlled close-ups of Reichenbach reveal a tortured man, even before he utters a single word. In fact, the film’s first line of dialogue comes from a young girl, who is returning Reichenbach his wallet, just prior to the attack for which he will be prosecuted. Herein lies an example of how the film suffers from its very literal and schematic narrative construction, containing a few too many useful co-incidences and plot elements. 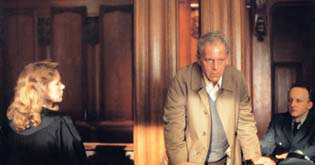 The young girl is the daughter of a kind-hearted lawyer named Gabriela Freund (Liv Ullmann, Golden Globe nominated for her performance here) who winds up representing Reichenbach in court. Later, it is discovered that while he had refused to cooperate verbally with his captors, he had drawn a portrait of Gabriela’s daughter, which after being uncovered and presented to her drives her to find him… and so on. These developments, while perhaps more convenient than believable, are important components that enable Rademakers to champion innocence in all it’s purity as something to be protected. With one stunning image in the courtroom, Rademakers captures the soul of the boy still within Reichenbach, as he clutches a faded photograph of his mother. With Reichenbach on trial for assault, his seemingly unprovoked attack is revealed to have been quite legitimate; his victim was the concentration camp doctor, bringing some new life to the trial and the film. Liv Ullmann, notably the star of Ingmar Bergman’s Persona (1966) and Cries and Whispers (1972), is excellent as Gabriela, a divorced mother who takes up the defense of Mr. Reichenbach, an effort which her contemporaries are reluctant to consider as valid. The screenplay goes to great lengths in establishing empathy for Gabriela, but her character’s credibility is occasionally affected by this schematic and unsubtle form of storytelling, in a manner befitting a cliched heroine. “I don’t wanna lose to a woman”, remarks her male opponent in the trial, who, along with his male counterparts, represents the sort of judicial bullying Rademakers’ sees as endemic of the whole system. To make matters worse, Gabriela’s ex-husband is a womanising, unreliable “bachelor” played by Peter Fonda, who, when she needs to get some work done, never seems to be able to take responsibility for their daughter. Fonda is solid in this role but his accent makes him sound like an ageing American hippy faking his way through an English language film shot with European actors. The film’s most affecting sequence comes in the form of a flashback as seen through the eyes of Reichenbach as a child (witnessing his sister’s torture). The cold mist and occasional whimper emitting from the pile of naked boys and girls evokes a sensation of pure corruption. After pulling on the lower legs of a child to ensure death by hanging, a soldier’s boot kicks a child’s toy out of the way – the ultimate insult to innocence for Rademakers, it seems. Overall, this is a well-devised film from a courageous director (see also 1973’s Because of the Cats). The Rose Garden pulls no punches in pitting justice against injustice, declaring that it is the latter which far too often comes out the victor. Despite its shortcomings, this is a worthwhile film not just for law students, but for movie fans looking to be taken through a courtroom drama in the truest sense of the word.